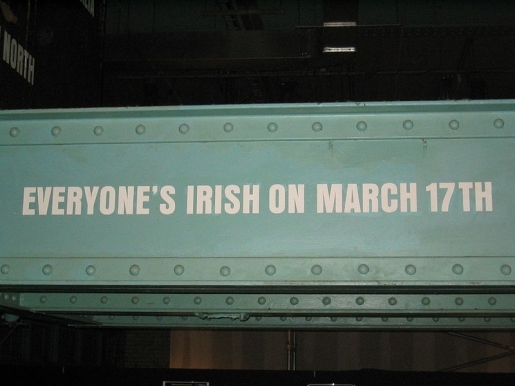 The Guinness Storehouse in Dublin, Ireland, with a friendly reminder. Slainte! Today, March 17, is a very special day for those with my particular bloodline, as it’s St. Patrick’s Day and the Guinness will flow freely at every pub with an O’Something in the title, and our non-Irish friends are more than welcome to join us in the celebrating of all things Irish, the wearing of the green, and the munching of the corned beef. Not that you need an excuse to enjoy a fine pint of Irish stout, mind you, but it never hurts. In the spirit of the day, I thought I’d share with you guys my favorite band, the Celtic punk godfathers (and godmother) Flogging Molly, who will no doubt be partying tonight while taking a break from their annual Green 17 tour. Just in case you needed a little help getting into the Irish spirit this morning before work, or just in case you’ll want something to fire you up for celebrations after work. Cheers, all. Make sure you find a designated driver if you party tonight, this weekend, or pretty much every time you party.